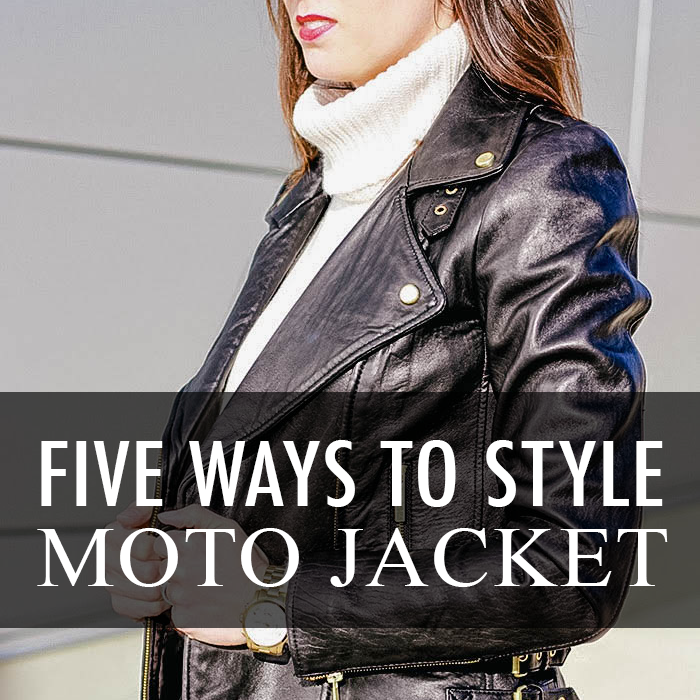 In keeping with my commitment to try to show you as many ways to maximize items in your closet, today, I am sharing five different ways to style a moto jacket. My moto jacket is one of my favorite jackets. I wear it a lot in the spring and fall. I find it can be worn so many different ways and pretty much works with most of my outfits. The first outfit is one of my favorites. I love the almost all black look with a pop of pink. The jeans are actually more of a dark grey, not a true black. 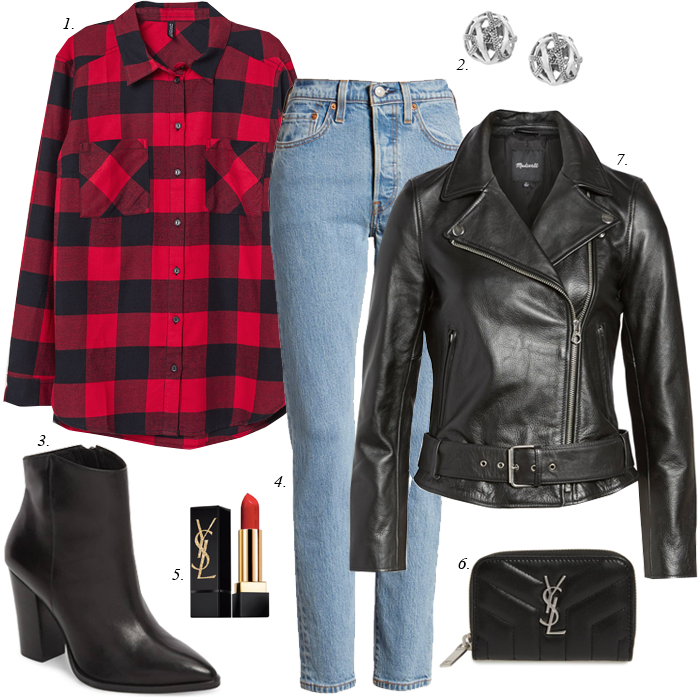 Another favorite look is the one with the red buffalo plaid shirt. (That plaid shirt happens to be on sale for $6!). This look is more of a 90s inspired outfit. As I have shown with these outfits, moto jackets can also be worn with solids, as well as stripes and prints, like the outfit where I mixed leopard and stripes. 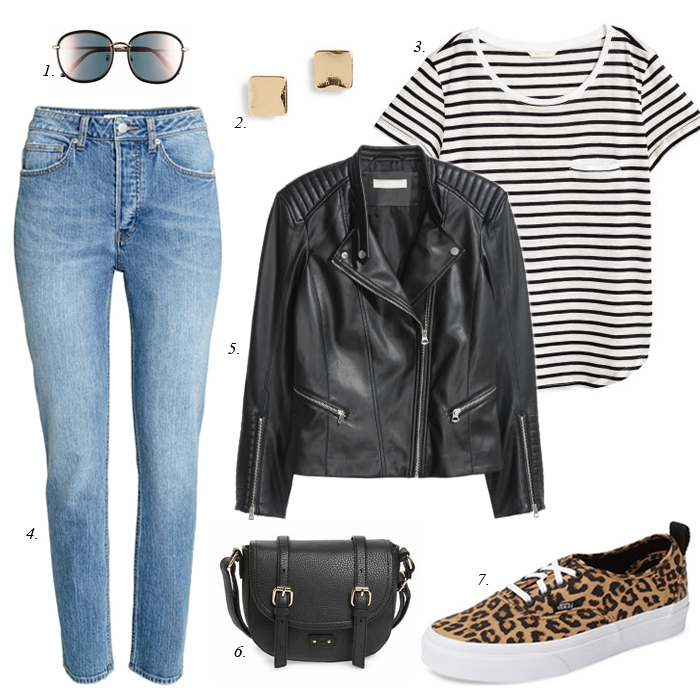 Or you can style a moto jacket with beige and some leopard print shoes. A black moto jacket can also be styled with lighter colors, like the blush pink and beige. You don't always have to style it with darker colors. For me, my black moto jacket is a closet staple, and one purchase that I am so glad I bought. Moto jackets can range in price. You can splurge on a leather option, or opt for a lesser expensive faux leather one. I have rounded up some moto jackets that I have found. I found this moto jacket that is on sale for $53 or this one on sale for $64. If you are looking for other ways to mix and match items from your closet I have shared the following guides. This cowl neck sweater for 40% off. This v-neck sweater - one of my favorites. I love these winter white dress pants for work - that are an extra 40% off. This plaid blazer is on sale for 60% off. These leopard booties on my wish list. This necklace for 40% off. This chunky sweater for 70% off. This striped sweater is on sale for $10. This flattering swimsuit on sale for $30 - originally $116. This blazer for 40% off - few sizes left! These cute rain boots are only $14. I like this cardigan that is on sale. This leopard print sweater is on sale (see different ways to style it HERE). This is one of my favorite blouses for an extra 40% off. I shared my favorite $20 sweater HERE. And, my under $25 utility jacket HERE. Today, I'd like to introduce my fellow Blended Blog friend, Abbie from Grumbling Grace. She is a "retired" french teacher and a mother to two precious girls. One her blog - she is honest and funny - and shares all about life struggles as a mom. She recently started a business (Salt + Light) with another one of our blogging friends, Deena. Be sure to stop by and say hello to Abbie. 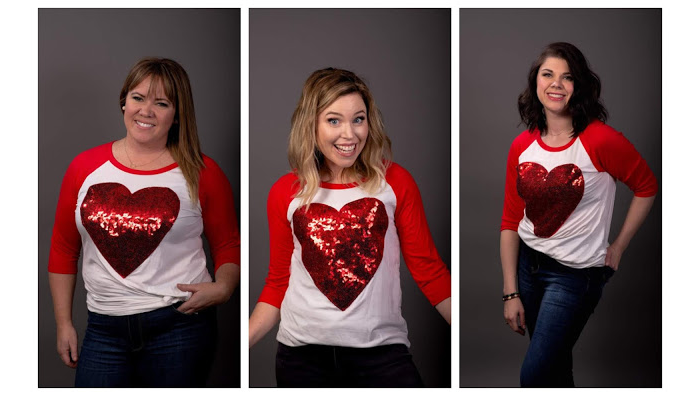 And, if you are looking for a cute tee - check out this "heart" baseball tee they are selling. My sweet moto Queen! Love. I hope to meet Abbie someday in person, she seems so very awesome! Love your styling with these moto jackets Lisa! Abbie always makes me smile. And your posts give me such great outfit ideas!